A Mark Leech header 15 minutes from earned beleaguered Shelbourne a first win in their eircom League of Ireland First Division campaign. 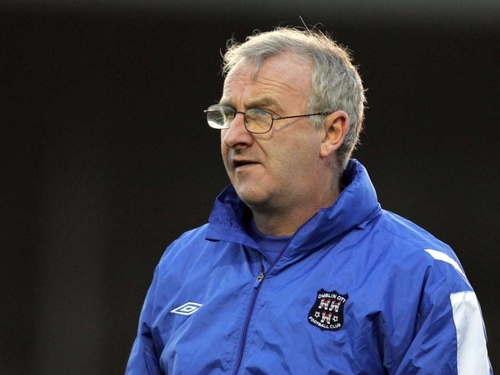 Dermot Keely’s charges had two points coming into the game against third-placed Athlone Town, who were hoping to bounce back from last week’s 6-2 reverse to Dundalk. 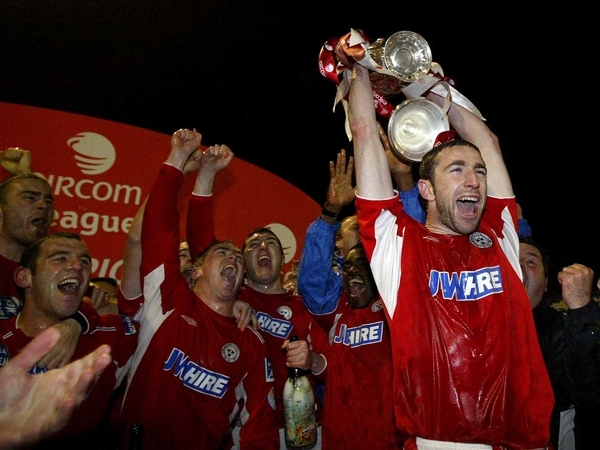 Shels opened brightly, with winger James Chambers winning a corner inside the first minute. But it was the visitors who had the first attempts on goal but Colm Heffernan and Davy Byrne both shot off target. Michael Harty nearly gave Athlone the lead but his curling shot on 13 minutes flew just wide of Shels keeper Tony O’Dowd’s left-hand post. Moments later Shels manager Dermot Keely was lambasting his back four for not working in tandem, with John Brophy appearing to incur the majority of the abuse. It seemed a touch harsh, although the hosts’ defence did look shaky at times. There were no such problems for Town, who mostly had to deal with Shels’ attempts to get down the channels. Leech almost gave the Reds the lead on 23 minutes when he drilled a low free, awarded for a foul on his strike partner Davitt Walsh, inches wide of an upright. Last year’s Premier Division champions had a great chance to take the lead seven minutes before the break. Leech played a fine pass to pick out Chambers floating in from the right wing, but the 20-year-old had his well-struck shot beaten away by Athlone stopper Danny O’Leary. Keely’s young charges were almost caught out as the interval approached. A ball over the top from Noel McGee left Niall O’Reilly stranded and landed in the path of Paul McTiernan. Unfortunately for Athlone, the forward struck his shot into the turf and harmlessly wide. The encounter had slumped into a pretty dull affair until Shels put some life into their game with just over 20 minutes remaining. Kieran Harte and Chambers both had shots blocked in the box before the former wasted a free-kick in a dangerous area by floating it over the crossbar. It signalled the start of the Drumcondra side’s best period. Leech gave Shelbourne fans, who have endured tough times of late, something to smile about with a quarter of an hour remaining. Glen Lacey’s deep corner was met by Brophy who re-directed the ball into the path of Leech who powered home from six yards out. Leech had two chances to double his tally after his initial strike, but he and Shels were more than content to hold out for the 1-0 victory. Shelbourne: Tony O’Dowd, O’Reilly, Murphy, Collins, Brophy, Crawford, Chambers, Harte, Leech, Walsh (McKenna, 51 mins), Lacey. Athlone Town: O’Leary, Frawley, Young (Casey, 81), Sheridan, Hope (Dave O’Dowd, 26 mins), Harty, Gavin, Byrne, McGee, McTiernan (Lavine, 61), Heffernan.